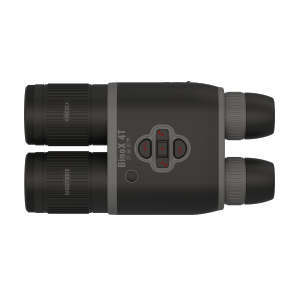 The ATN Binox-4T 384-4.5-18x 384x288 50mm Smart Thermal Binocular has the most magnification and longest detection range for this sensor size. 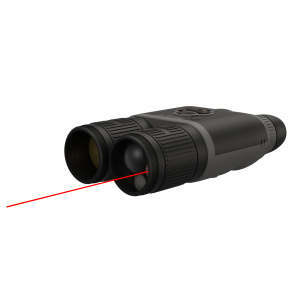 Its 384x288 sensor combines with its 50mm objective lens to give you 4.5-18x zoom capability with a maximum angular field of view of 6°x4.7°, making it the right choice when you favor magnification over field of view. The view is displayed on dual 1280x720 screens (one for each eye) in your choice of several color palettes. Thanks to the large objective lens, the human detection range is nearly double the 25mm version at 1800 yards. 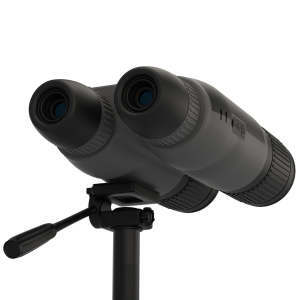 The BinoX 4T 384 50mm comes with all the high-tech features as the rest of the series. It can record video at 1280x720x2 HD Display with 60 fps refresh rate, or capture images at the same resolution. 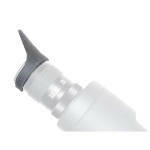 Either can be stored on a micro SD card (4 - 64GB). Smart Technology features are WiFi (Streaming, Gallery, & Controls) iOS & Android 3D, Magnetometer, Bluetooth, E-Barometer, 3D Accelerometer, 3D Gyroscope, Smart Range Finder, E-Compass, Smooth Zoom, Microphone, and a built-in laser rangefinder. 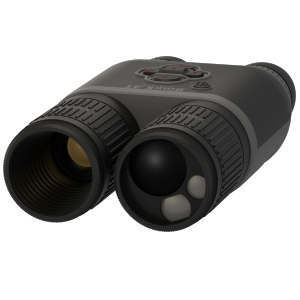 The laser rangefinder has a range of 5 to 1000 yards with an accuracy of ±1 yard. 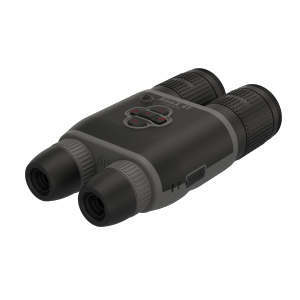 This information can be shared with ATN Smart riflescopes or the ATN Obsidian App using either WiFi or Bluetooth. You can also use either communications method to stream live video to anyone with the Obsidian app on their smart phone or tablet.